Posted on January 11, 2019 at 12:45 pm. 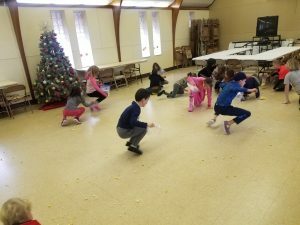 This week, our Upper Elementary students learned about the history of New Year’s Resolutions while the Lower Elementary students discussed the origins of the names of our months with Mr. Matt during Latin! 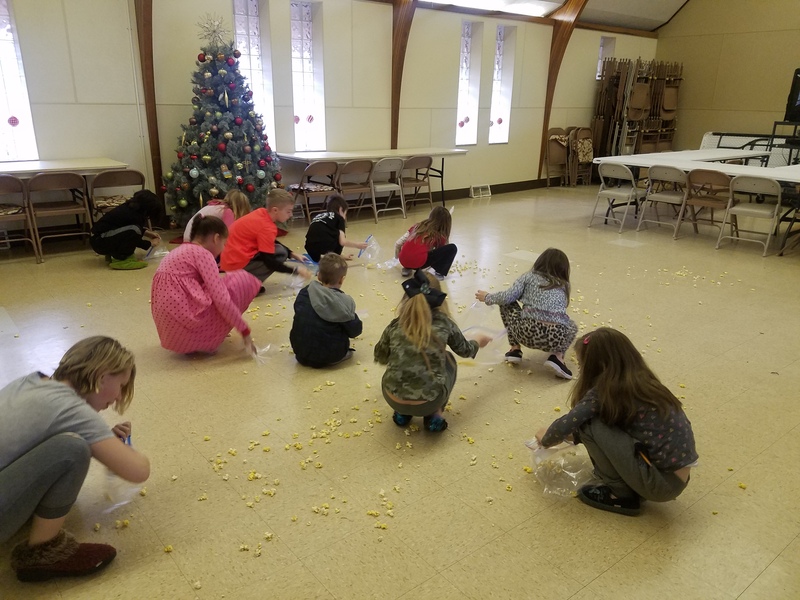 The Upper Elementary students found out that the Babylonians celebrated New Year’s in mid-March and made resolutions as offerings to the gods. The Lower Elementary students discussed with Mr. Matt that January was named after Janus, the Roman god of doors, because January represents all new opportunities and possibilities. These fourth year students are continuing to learn about cells by labeling the parts of plant and animal cells. While studying the parts of each type of cell, they will create a 3D model of a cell at home to present to the class. Our students are hoping to make edible models that they can eat after sharing! This first year student wanted to present a lesson on completing a maze to the other students. 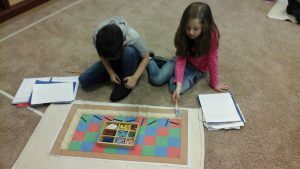 She drew a maze, with many different tricks and turns and helped students work their way through it. Here, she is presenting her lesson to a second year friend! One of our “Tribe” activities this week was to communicate silently in our Tribe to complete a matching activity. Each group was given an envelope with fifteen different animal names on fifteen triangles. 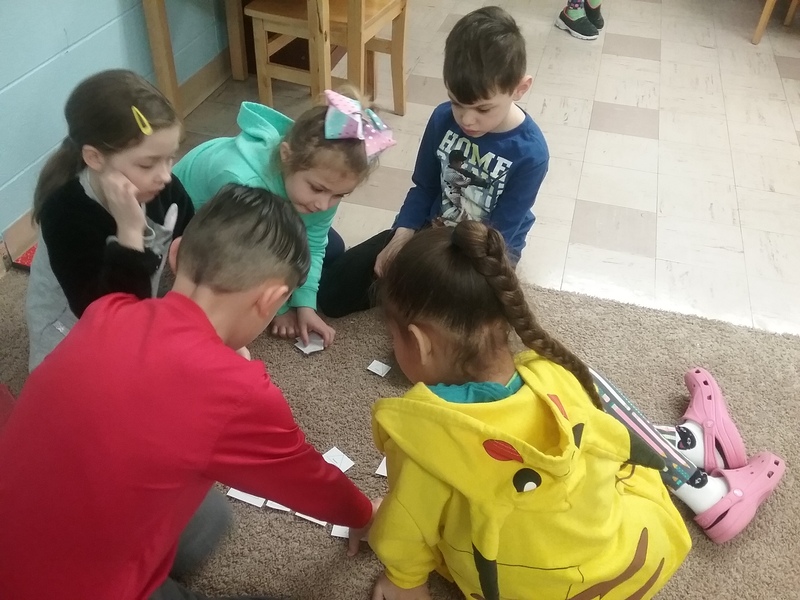 They had to communicate silently to sort the animal cards into five groups of three based on similarities between the animals. Not only did they have to be silent, but they weren’t allowed to take triangles from each other, forcing them to take other’s thoughts and ideas into consideration. After we finished, we discussed how we communicated effectively and how we could improve in the future. 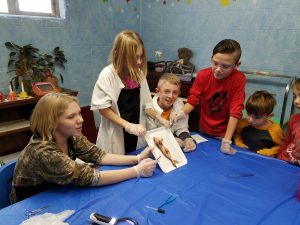 Our Upper Elementary students did their first dissecting this week! To prepare, they had to learn about the circulation, digestion, respiration, nervous system, support and movement, and reproduction of all vertebrates and invertebrates. They dissected an earthworm, a grasshopper, and a frog. 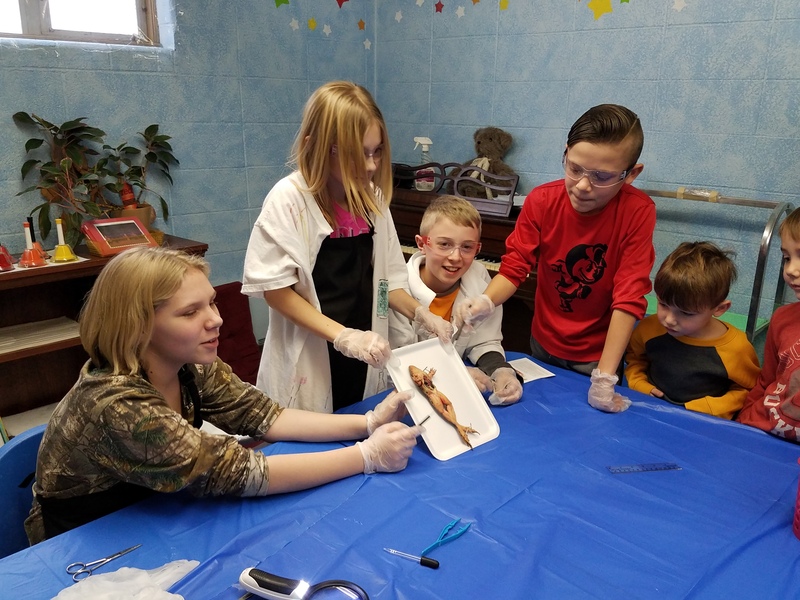 Each time they finished a dissection, they took the time to explain what they learned to our younger students and to Ms. Courtney’s younger students. Next week we travel to the Cleveland Museum of Natural History to dissect a sheep heart. All students will begin Wax Museum research on Monday! 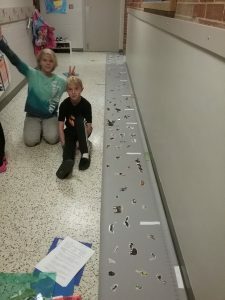 Next week first year students will make a family timeline, will build coins up to $1, will create a map of the farm, and will learn the parts of the stem. Second year students will be introduced to decimals, will make a family timeline, and will study leaf blades. Third year students will add and subtract time, will create a timeline, and will find the taxonomy of invertebrates. 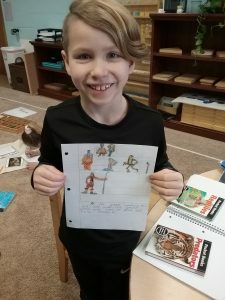 Upper Elementary students will have their dissection field trip, will add numbers in different bases, and will research ancient civilizations and early humans. Posted on December 21, 2018 at 9:12 pm. How is this half of the school year already over? So far this year, we have gone to a pumpkin farm, traveled to the Cleveland Zoo, and have performed at Mulberry Gardens. We have learned about new friends and continued building friendships with our returning students. We have studied the external characteristics of vertebrates and how cells work. We’ve discussed North and South America and have cooked to celebrate our friendship. Our students are creating materials and presenting lessons. We share messages when we have concerns in the classroom. We work every day to learn more and become better. I am so excited for the rest of this school year! This second year student is writing about the Ancient Greek Civilization. He has drawn different clothing, different structures, types of exercise, and how they defended themselves. Next, they will study the Middle Ages. 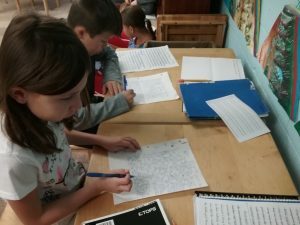 These first year students are creating a crossword puzzle stemming from the word “happy.” They each take a turn to build a word and use a new word to branch off of when they run out of space. 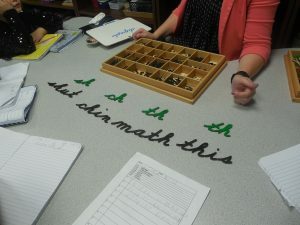 These students also enjoy building a word, then writing it backwards and trying to sound out the silly word they made. These activities help students build their knowledge of phonemes and practice decoding! One of our favorite whole class lessons is “The Food Chain.” We throw popcorn on the floor and release the students that are chosen to be crickets. The crickets must move and sound like crickets throughout the activity and try to collect as much popcorn as possible. Next, frogs are released and try to capture the crickets. Then, hawks are released and try to capture the frogs. At the end, the remaining animals check their food bags for red popcorn. The red popcorn was contaminated food or litter that they accidentally ate. After that, whoever is left are the winners. After our lesson, we discuss what animals could also be in this food chain and what we learned from the experiment. Our Last Day! 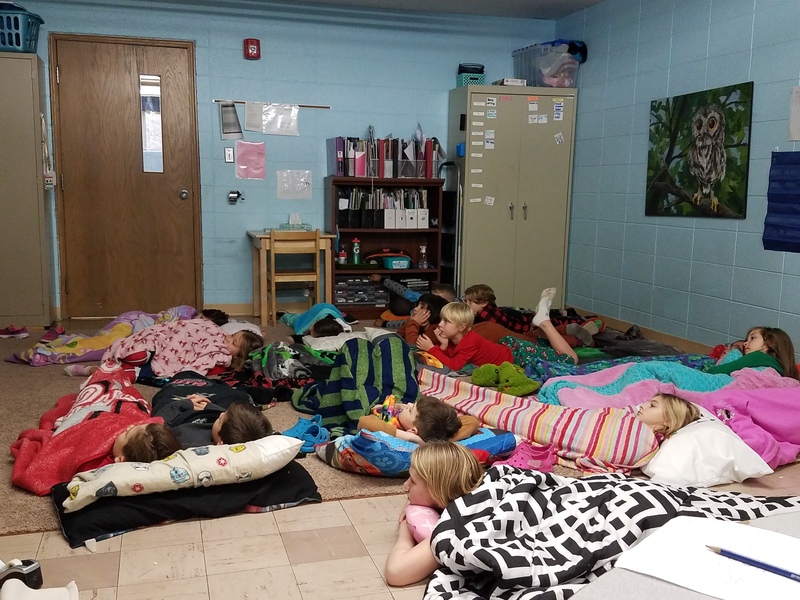 We finally finished reading “A Little Princess” so we were able to watch the movie about it! After playing board games, we settled in for some hot chocolate and our movie! Posted on December 14, 2018 at 2:11 am. This week our “Peek” was written by two of our students! These students read our previous blogs, took pictures around the room, and filled in a blog template. The students did some editing together, and with a teacher, so what you will read below is their final product. 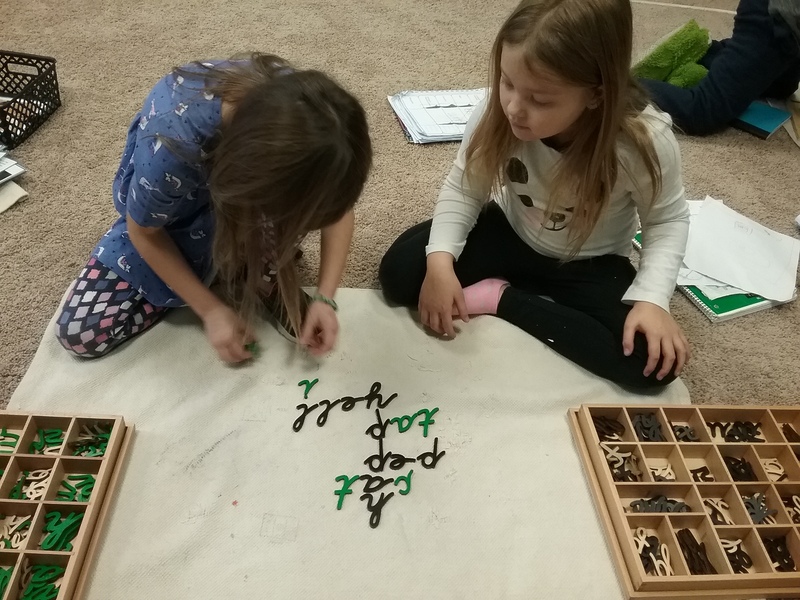 There are still some misspelled words in their final product, but in a Montessori classroom we focus on the process, instead of the end result. Dr. Montessori believed when we put all of the emphasis on the final product, we devalue everything leading up to that point. This can discourage repetition which will make mastery of a skill difficult. The purpose of the students writing the blog is to provide you with a glimpse into the room through their eyes, to provide them with practice of real world skills, and to give them a deeper understanding of the materials in the room. We hope you enjoy their work! Throughout the week the students are working very hard. 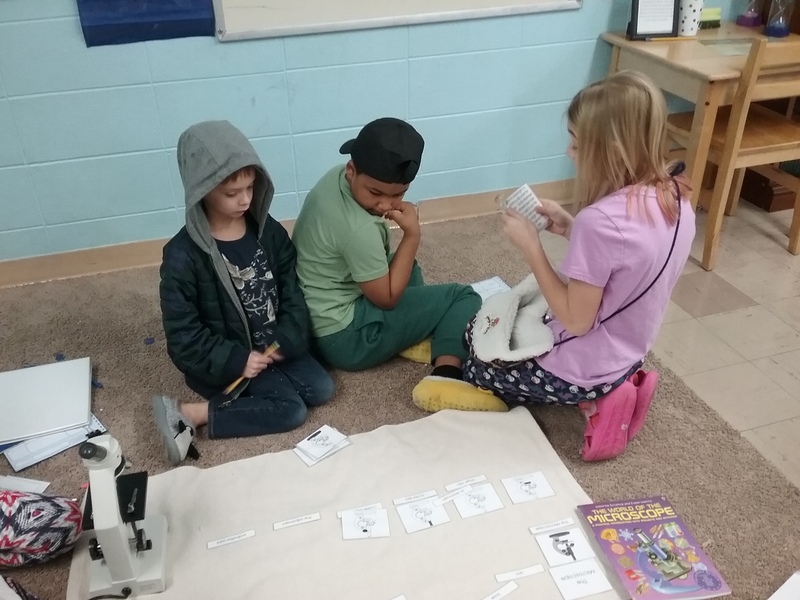 3, 4, and 5 have gotten their microscope license. Everyone has been listening. 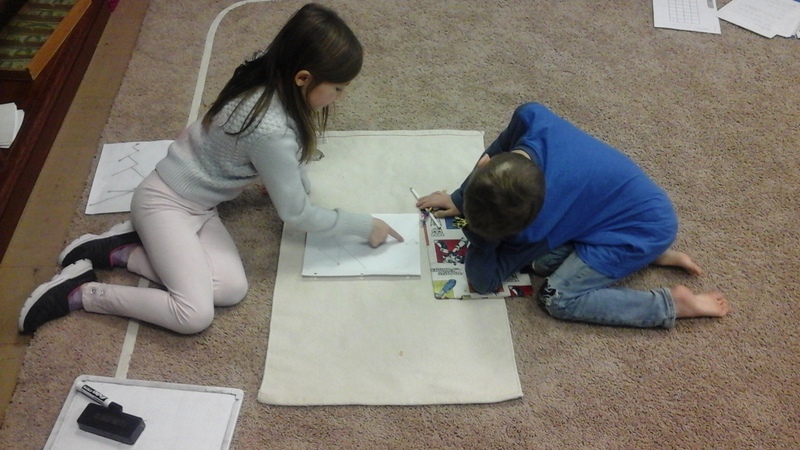 The second graders learned subtracting fractions with like dinominators. 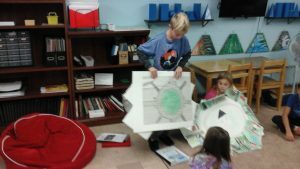 The first graders learned energy transformation. In this picture 2 second graders are working on geografic feature cards. After learning all of these cards they will make an imaginary island. A fourth grader is working on the diseckting microscope. She was looking at foraminifera, which is a plankton. 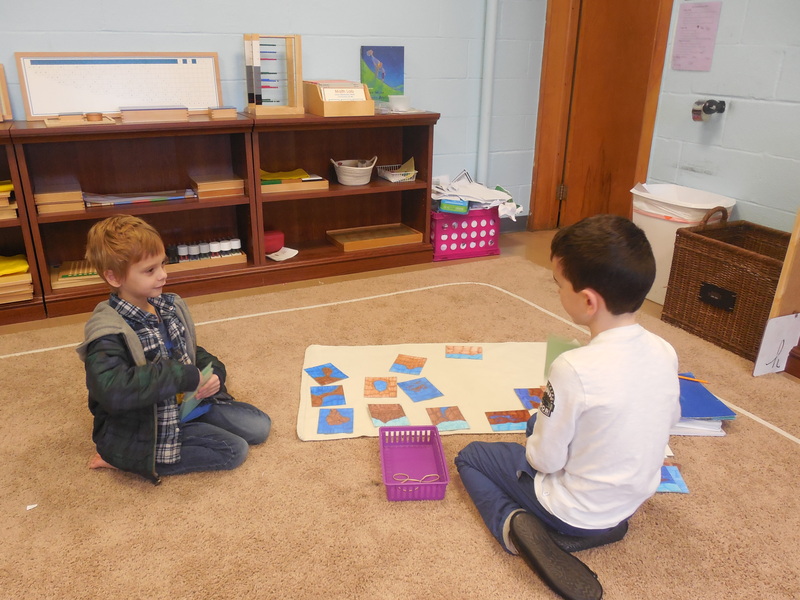 The first graders are getting a lesson on Multiplication Stamp Game. A third grader is reading a “Fish in a Tree.” It is about a girl that has dyslexia. Friday the 21 is Pajama Day. Next week, first year students will practice the Multiplication Bead Board, learn the origin of their name, study straight and curved lines, and will practice being in a food chain. Second year students will review multiples with the bead bars, will continue studying the relationship between angles, and will learn about the rock cycle. The third graders will begin finding the divisibility of numbers, will write commas in lists, and will discuss the positions of flower ovaries. The fourth years will study the divisibility of 9, will study Early Humans vocabulary, and will discuss the parts of a cell. The fifth year students will review plural possessives and will finish studying the relationships of circles. Friday, December 21st is Pajama Day. 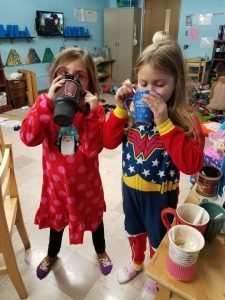 Your child may wear pajamas to school. They may bring a pillow and blanket to enjoy the movie “The Little Princess.” Students may also bring a board game. Each child will still need a lunch and a water bottle. 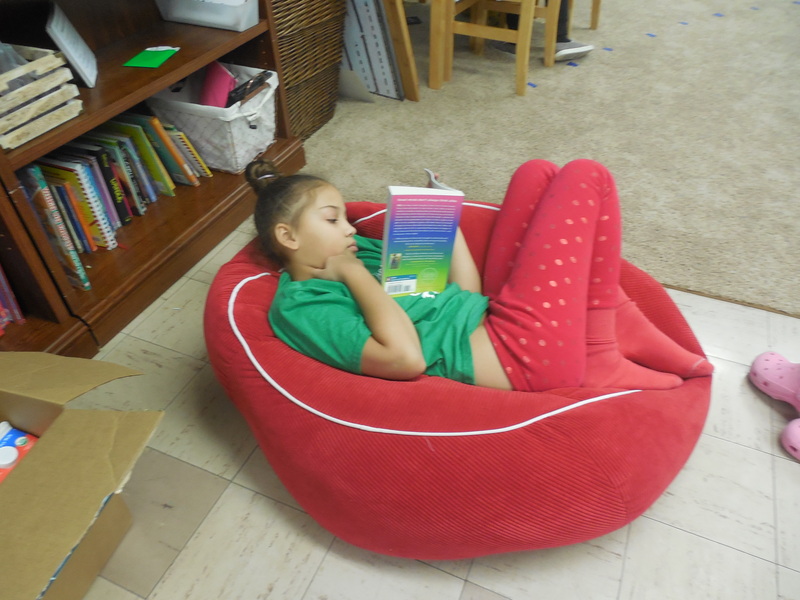 Your child will still need to bring in their reading log for conferences. Posted on December 10, 2018 at 2:14 am. This fifth grade student is helping these first grade girls research the country of Brazil for their South America Continent Study. He helped the girls use the index to find the page that they needed to answer their questions then helped them read challenging words. These students were so thankful for the help of this friend! 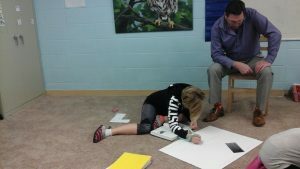 This first year student is working with our “Animals of the Continents” work. He has sorted photos of animals into piles representing different continents, then checks his work with the control cards. He is adding his own drawings of animals to our work! This second year student is working on writing capital E in cursive. 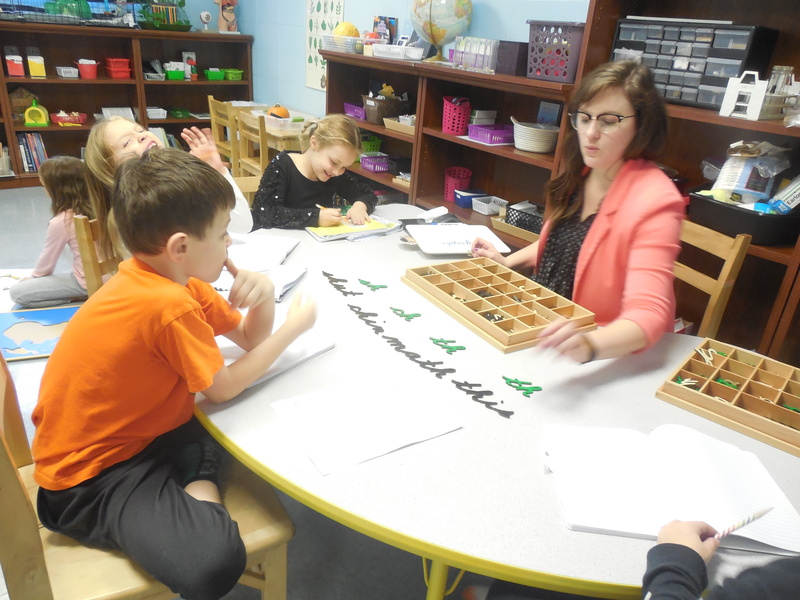 Each week, our students work with Ms. Kelley on proper formation and strokes of lowercase and capital cursive letters and words. Ms. Kelley also has them do different activities like writing in cursive on each other’s backs or writing the sight words we are practicing to make handwriting exciting. This second year student LOVES writing in cursive thanks to Ms. Courtney! Our Upper Elementary students are completing the final draft of their persuasive essays. Two of our older students wrote why animals should be kept in cages and two write why they should not be. We will be sharing these essays with the class and voting on which argument was the most successful and why! These second and third year students are being quizzed on the parts of the compound microscope by a fourth grader that has her microscope license for the compound and dissecting microscopes. She asked them to name the parts of the microscope and had them explain what each part does. This Friday they will take their quiz to be able to use the microscope independently! Next week, our first year students will review multiplication lessons, will be introduced to Sentence Analysis, and will discuss mechanical energy. Our second year students will subtract fractions with unlike denominators, will write a biography about their classroom mentor, and will discuss types of seeds. 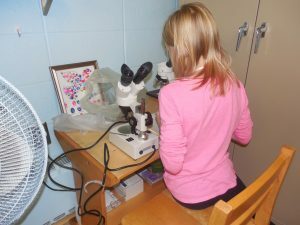 Our third year students will continue multiplying on the Large Bead Frame, will write a biography about their classroom mentor, and will research platyhelminthes. Our fourth year students will find the prime factors of numbers, will determine relationships between humans and apes, and will discuss the characteristics and energy of cells. 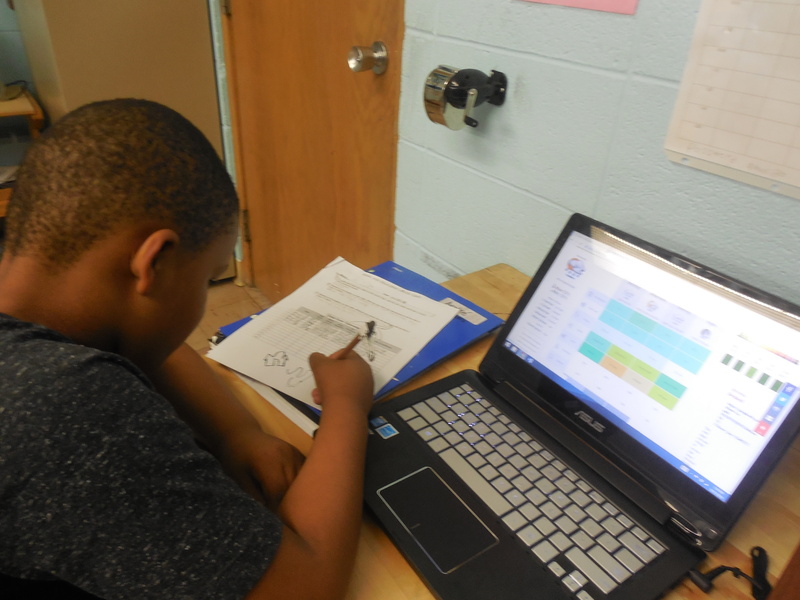 Our fifth year students will create a pictograph on Excel, will define Latin and Greek affixes, and will learn about reciprocals of fractions. Wednesday, December 12 – Christmas Show Rehearsal. Please check your email from the school office for information about drop off and the rehearsal. Make sure to take your child to the restroom BEFORE you bring them to the auditorium. Ms. Lisa will have all piano music for piano students. They will not need their books. Friday, December 14 – Elementary Box Top Pizza Party – We will have pizza (including gluten free), veggies, and snacks to celebrate collecting the most Box Tops at our campus. We will also be wearing Christmas Sweaters! Please do not feel the need to buy a special sweater for this day, it is an optional dress up day. Friday, December 14 – Christmas Show. Take your child to the restroom before dropping them off. Bring your child’s pajamas or “‘Twas the Night Before Christmas” costume in a separate LABELED bag. If you have multiple children in our classroom, please put each of their clothes in a separate bag to make things easier for us while they change. Students will change themselves for our play and for Kids Bop in the back dressing rooms. Look for more info from me on Remind later this week and from the school office. Posted on November 30, 2018 at 3:25 am. We enjoyed being back together this week. This week has been busy with students presenting lessons, students presenting research, students assisting in lesson presentations, and of course, Christmas Show practice! 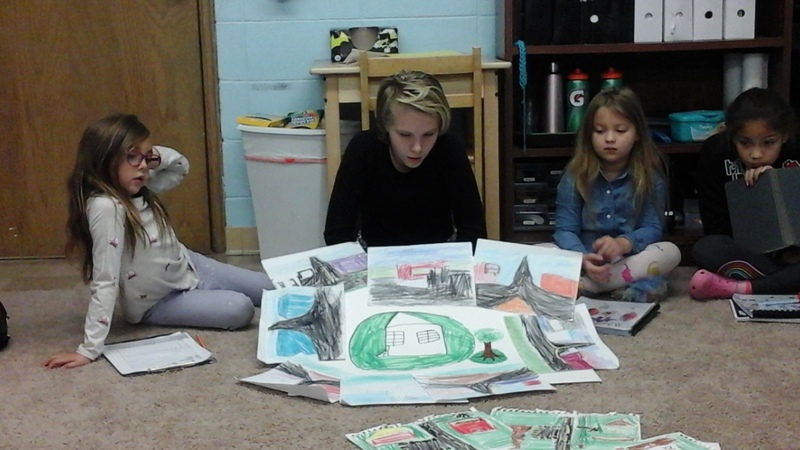 Three of our reading groups have completed the stories they have been working through so far this school year. Our “Rocket Readers” group has completed the book “Tornado” by Betsy Byars. 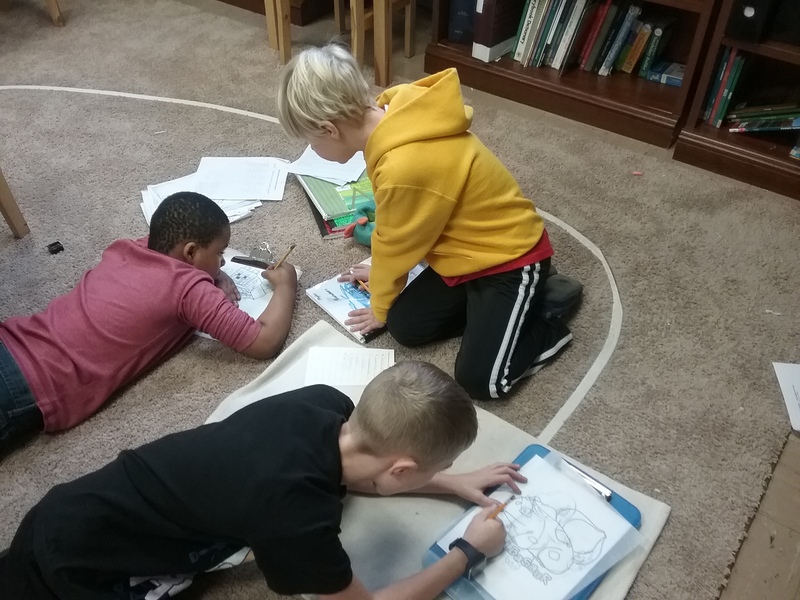 After completing their story, they wrote a research book about tornadoes which included information about what a tornado is, how its severity is tracked, and how to stay safe when one is spotted. They shared this information with our class! The “Six Scoops” group finished reading “From the Mixed-Up Files of Mrs. Basil E. Frankweiler” and researched the historical figures mentioned throughout the story. 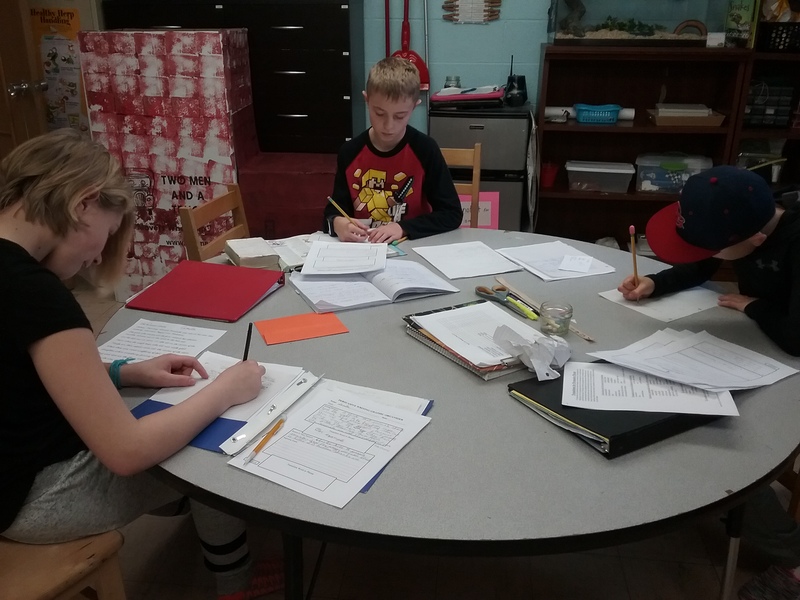 The “Senior Readers” group completed “The One and Only Ivan” and are writing persuasive essays about whether or not animals should be kept in cages. One of our first year students asked before break if he could present a lesson on tracing to the first and second year students. After break, he worked with me to add his lessons to our schedule and invited children to a lesson, just like we do. He even assigned them follow-up work! 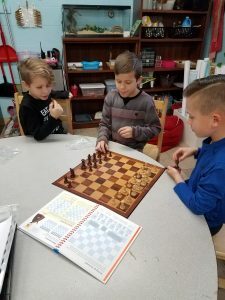 Our older friends were so interested they asked him for a lesson, too! It is so wonderful to see our newer students showing their skills to older friends and all our students showing so much respect during the lessons! This first year student is researching marine reptiles from the Mesozoic Era. She used books to find what the name of her plesiosaur meant, where its fossils were found, what size it was, and why it is so memorable. Our first year students will share their research at Community Meeting Monday. These second year students are working with our “Prepared Angles.” This work is comprised of task cards that tell students the size of an angle and the length of the angle’s sides. The students then need to measure the angle with a protractor and make sure the sides match the length listed on the cards. 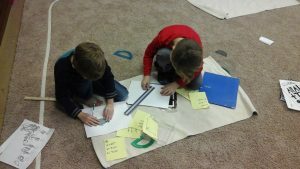 This work gives students practice measuring with a protractor and a ruler. This fourth year student helped me present a lesson about the eye, the ear, and the tooth. 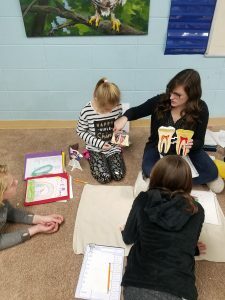 Last year as a third grader, she had lessons about the human anatomy and was able to share that information with the current third graders. The third graders will continue to study the human body and build a model of it throughout the year. Next week, we will begin new novels in our reading groups that finished their books. The second year students will be joining each other in a reading group and will be voting on the book they want to read. The third year students will join our Upper Elementary students in reading “A Fish in a Tree.” Our lower elementary students will write biographies about their peer mentor, will study sentence analysis, and will discuss light and friction. Our Upper Elementary students will study portmanteaus, interjections, density and matter, and decimals. Posted on November 21, 2018 at 2:05 am. On Thanksgiving, my dad never made us go around the table and say what we are thankful for. I assume this was because he knew I would say something like, “I’m thankful for my Game Boy,” or “I’m thankful Zach isn’t talking right now (my brother and I REALLY loved being around each other),” but as someone that spends so much time with your children, I wanted to share the things I see each day that make me thankful. I am thankful that, although they sometimes bicker like brothers and sisters, your children are able to step aside and talk through concerns and problems with children and adults. 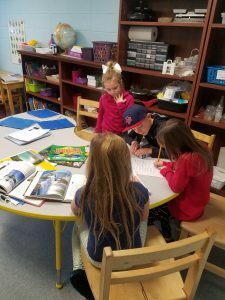 I am thankful I get to constantly see older students helping younger students be more independent. I am thankful for the times when students are disappointed in themselves and another child takes time out of their day to go see how they can help or to give some words of encouragement. I am thankful for Community Meeting and the chance it gives me to see students solving their own problems and voicing their concerns, without needing any adult intervention or assistance. 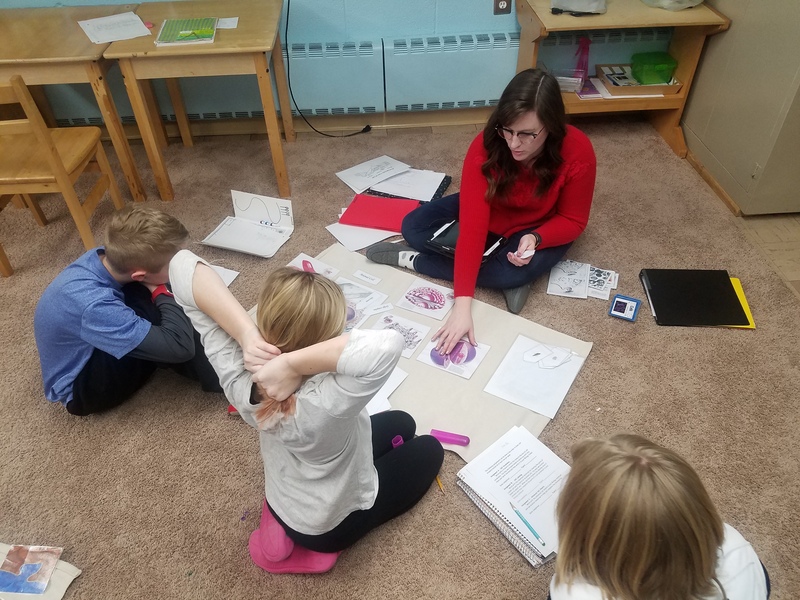 I am thankful that our students feel so comfortable in our environment that they plan and execute lessons for other students as if they spent years studying education and child development. I am thankful to spend every day showing new lessons to your children and seeing how much they can do with the information they are given, almost always surpassing my expectations. This second year student is subtracting on the Small Bead Frame. She is practicing exchanging and writing the difference in her math equation book. She can practice this same equation with the Stamp Game and the Golden Beads. 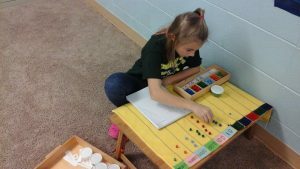 Once she is more comfortable with subtracting large numbers, she will be able to easily solve large equations on paper! This month we are studying South America. 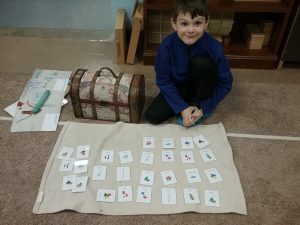 This first grade student is playing “South America Slap-It.” This is a game for students to read riddles and decide which capital belongs to each country. The person who slaps the card first, gets to keep it, and the person with the most cards at the end is the winner! These third grade students are working on handwriting. 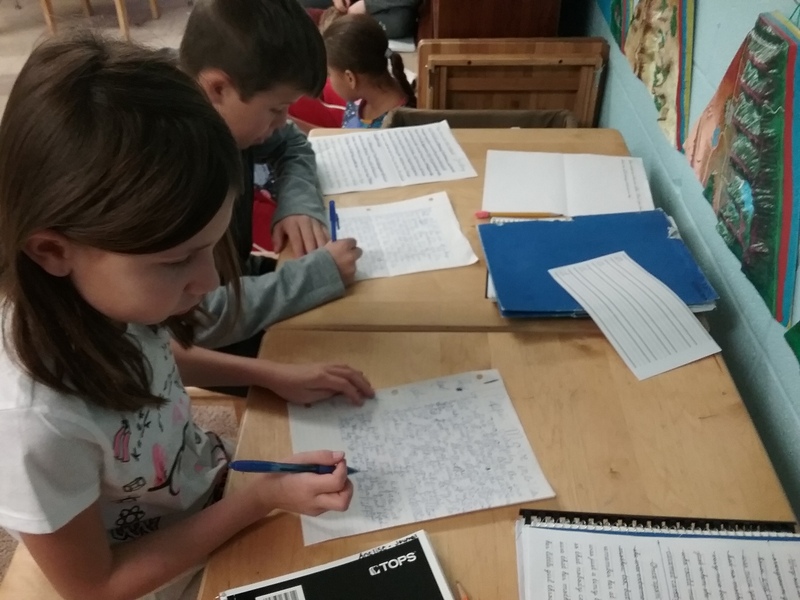 They are rewriting paragraphs from “Pippi Longstocking” to practice their cursive handwriting. 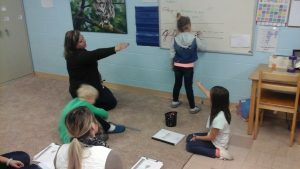 Each week, Ms. Kelley reviews their handwriting and practices letters with them using our white board and large motor movements. 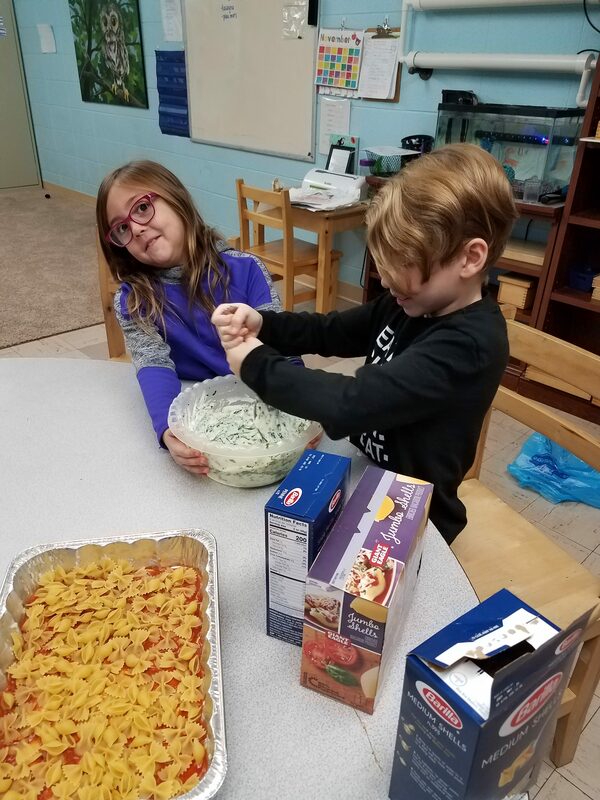 Today, we enjoyed making lasagna and eating with Ms. Courtney’s class. We enjoyed lasagna, bread, carrots, applesauce, and cookies. To make our pasta, we first discussed the history of “The Island of P’sta.” This is an imaginary island that leads us to treat the baking of lasagna as a archaeological dig. Students found marble flooring (lasagna noodles) covering pearls (pasta shells and the main export of P’sta), chariot wheels (rotelle), arm and leg bones (penne and ziti), butterfly fossils (farfalle), coral fossils (rotini), and helmets (large shells), and used this information to determine what could have happened on the Island of P’sta after their invasion by the Romans. These students are using our new Chess Book, donated by a family, to learn the names of the pieces, how they move, and how to complete a game. We were also gifted a book about coding using Scratch, which the students are thoroughly enjoying. Thank you to the family that donated these books! Next week, first year students will use the Subtraction Snake Game, review the use of a verb, continue studying fundamental needs, further investigate the Five Kingdom Chart, and begin planet research. Second year students will continue studying geographic features, will label the parts of a seed, will bisect an angle, and will start multiplying on the Checkerboard! 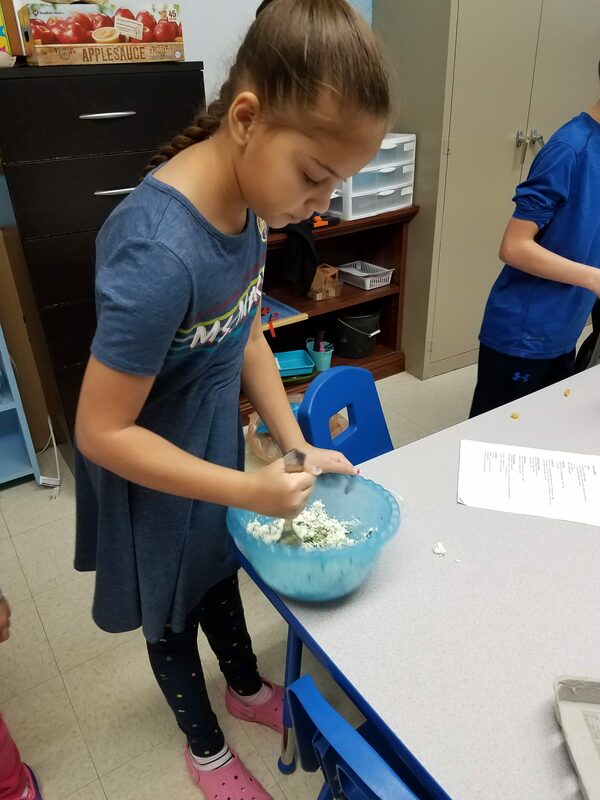 Third year students will research the eye, ear, and tooth, will find irregular past tense verbs, and will perfect their measuring skills with measuring cups and spoons. Fourth year students find discuss adverbials in sentences, the unit as part of a base 10 number system, and will discuss elements in our universe. Fifth year students will use the order of operations, will research mammals, will be introduced to genealogy and will write figures of speech. Posted on November 11, 2018 at 5:09 pm. 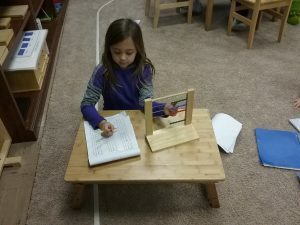 One of my favorite things about the Montessori Elementary Philosophy, that also might be the toughest thing to adjust to as a new Elementary student, is the amount of responsibility and freedom our students have. I envy that they have the opportunity at the age of 6 or 7 to begin learning how they learn best, how to manage their time, how to prioritize, how to ask adults or peers for help, how to work with people that aren’t your best friend and still produce a great project, how to reflect on your week of work and social interaction and find ways to improve, things to be proud of, and to set a goal for the following week. While this is a struggle for some new students more than others, they are always, always trying again the next week. Their peers are asking how their conference went and asking them what they think they could improve, or telling them they did a good job and that they noticed how hard they worked on a certain assignment. I see students asking others if they can help them plan their time or if they can explain what they have found to be successful in the past. I hear older students saying things like, “Oh, I remember that work. I had a hard time with it, too, but it gets easier when you practice.” Imagine if, at their age, you had the support system of friends, that you may have known longer than your own siblings, that are (almost) always willing to encourage and guide you when you struggle, and that never stop believing in you. Why weren’t we all educated this way! The first year students have recently learned how to use a dictionary. 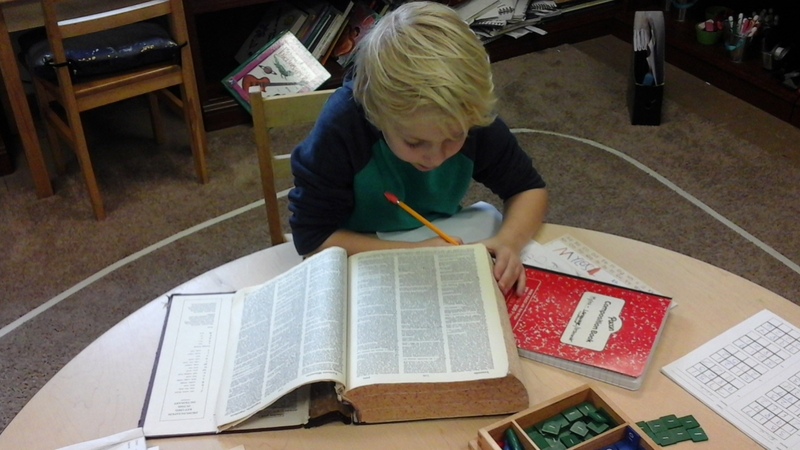 They have been practicing alphabetizing for a few weeks and we discussed how that work helps with a dictionary. We found guide words on each page and talked about how to find the part of speech, pronunciation, and definition. 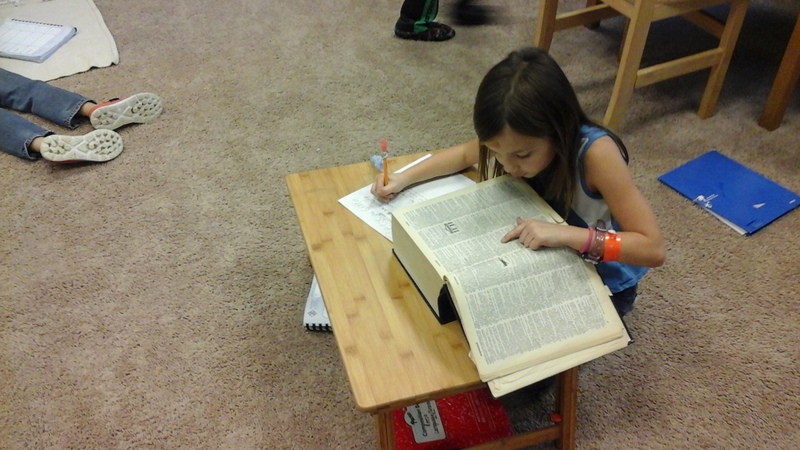 Our first year students can now participate in our “Word of the Day” and find the homophones on their spelling lists. Some of our students traveled to Tallmadge Circle a few weeks ago to review how to use a compass and to create a map. Our students have been sharing their colored map and explaining what they found most exciting and most challenging about the project. Some of our students shared organization tips and coloring ideas! These second year students are measuring angles they have drawn using a protractor. Now that many of our second year students can add on paper, they can check if their angles are indeed supplementary or if they need to remeasure. These second year students are practicing reading numbers on the Checkerboard. Before they can multiply large numbers, they need to be able to read their multiplicand, multiplier, and product. To prepare them for recording a product, they write down the number they have read after a friend lets them know that they have read it correctly. These students are reading the number 999,999,999! 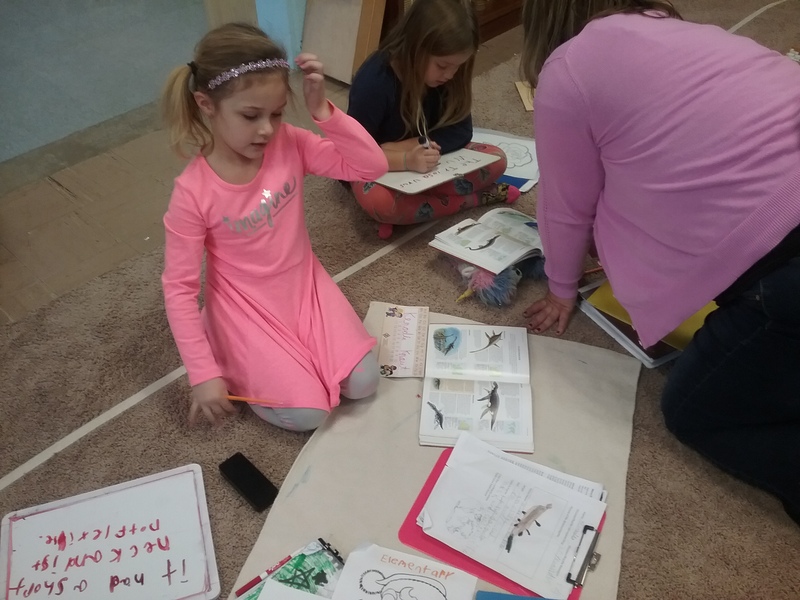 Next week, first year students will subtract on the Small Bead Frame, will practice dividing syllables, will continue studying the Fundamental Needs of Humans, will begin dinosaur research, and review the external characteristics of mammals. 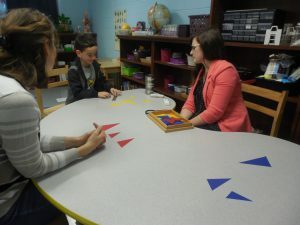 The second year students will review Rainbow Factoring, will study past and present tense verbs, will continue studying the Fundamental Needs of Humans, and will draw angles with a protractor. Third year students will add fractions with like denominators, continue studying Fundamental Needs of Humans, will discuss singular possessives of nouns, and will discuss the main characteristics of cnidarians. Fourth year students will find common factors, will practice writing commas and quotation marks in dialogue, will continue studying area, and will classify kingdoms of living things. Fifth year students will find the divisibility rules of 11, will study garbology, will find the parts of a circle, and will research mammals. Friday, November 16 – Parent-Teacher Conferences – This is a No School Day for students and there will not be childcare available. Please send me any lessons you would like to see during our time together! 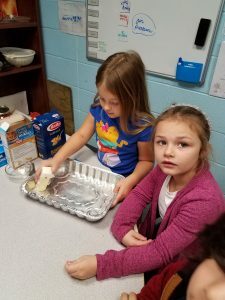 Tuesday, November 20 – Ms. Courtney’s room and our room will cook and bake together to celebrate friendship and the things we are thankful for. Your child will not need a lunch this day. Please look for the sign-up list soon to help us make this possible. Posted on November 1, 2018 at 4:30 pm. This week we had a lot of language lessons. The first graders had a lesson on multiples. 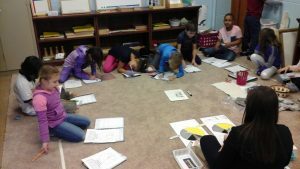 The secont graders had a detective triangle game lesson.The thierd graders had adjective suffexes. The forth graders had finding humans. The fith graders had plotting points on a graph. Ms. Ashley is teaching some kids the detective triangle game. It helps students identify triangles by size, sides and angles. This therd grader is recording the wether for the day. He is researching 3 different cities from all around the world. All of the students are working on follow-up work. All of them have been working very hard. Next week we will begin practicing for the Christmas Show (yes, already!). Please look for an email in the next two weeks to see what your student will need to wear or practice. 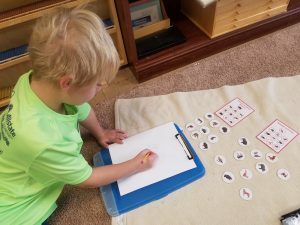 Next week first year students will subtract with the Stamp Game, will discuss fall and winter holidays, will begin the study of the fundamental needs of humans, and will learn about different animals. Second year students will have their first Checkerboard lesson, will discuss contractions, will practice using a protractor, and will study South America. 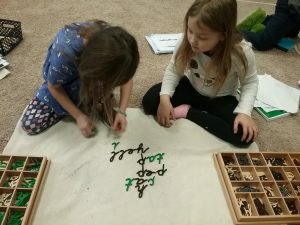 Third year students will multiply on the Large Bead Frame, will learn new capitalization rules, will use grids and coordinates in mapping, and will create animal riddles for younger students. Fourth year students will continue working with multiples, will discuss the characteristics of vertebrates, will review the area of plane figures, and will classify different objects. Fifth year students will continue to study factors, will be introduced to archaeology, will classify mammals, and will study density and matter. Posted on October 26, 2018 at 5:31 pm. This week was full of exciting lessons and events. We completed lessons with taste tests, challenging math works, and continued our exploration of the history of Earth. 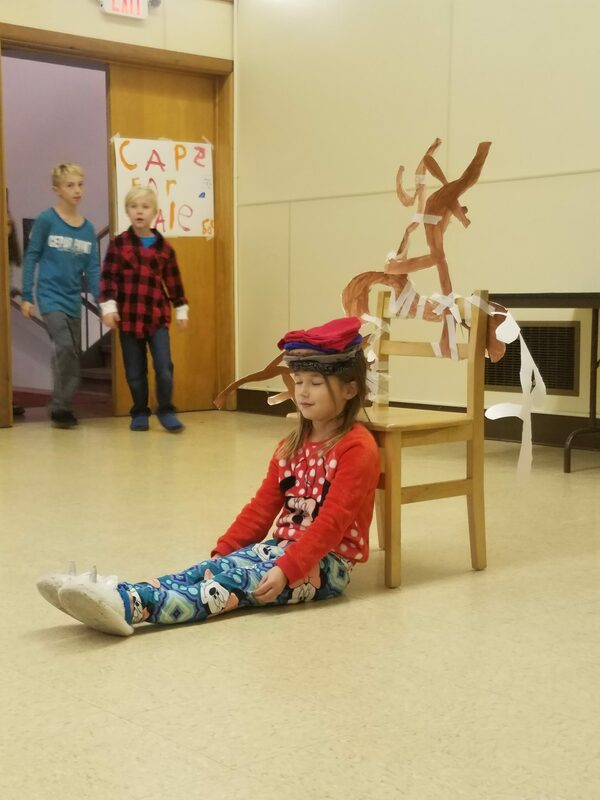 We were thrilled to perform “Caps for Sale” for our families and all the Primary Classrooms. We decorated for the Halloween party, prepared the food, and played games together. 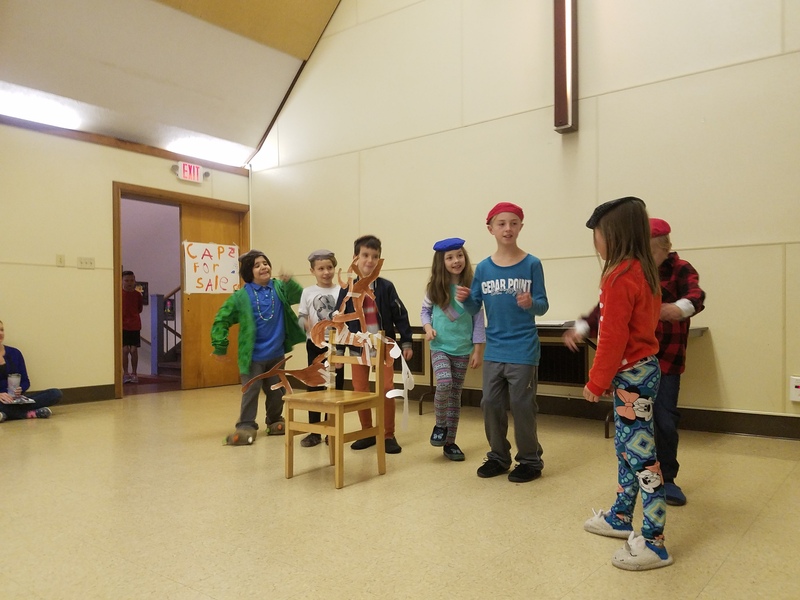 Putting on all student performances and planning student only parties, gives children the opportunity to learn how to work and collaborate with others. This also gives them real life experience about what happens when a team or group doesn’t work well together or communicate! Thank you to all the parents that helped us sew and that provided the materials we needed for our Halloween party! This student is practicing forming and reading decimal numbers into the millionths. After mastery of forming and reading decimals, she will add, subtract, multiply, and divide them using our materials. 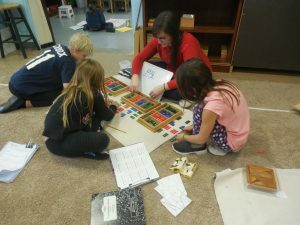 The Montessori Decimal Material allows students to physically build and manipulate decimal numbers to understand their relationship to whole numbers. This week we discussed the Clock of Eras. This material is another representation of the Timeline of Life. It shows students different eras of the Earth’s existence broken down into a 12 hour clock. We discussed different changes in each era and the etymology of the era names. Students are recreating the clock for their follow-up work. These fourth year students are using our blank timeline to recreate the Timeline of Life. This blank timeline is used throughout the Upper Elementary curriculum and can be adapted to measure any length of time. These students calculated where to place labels for each era from 4.5 billion years ago until now! The first year students had a lesson about nutrition. 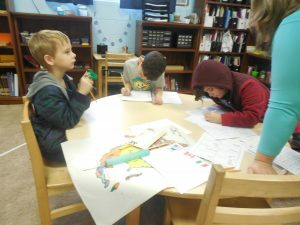 They discussed which foods are healthy and how often to eat all their favorite foods. 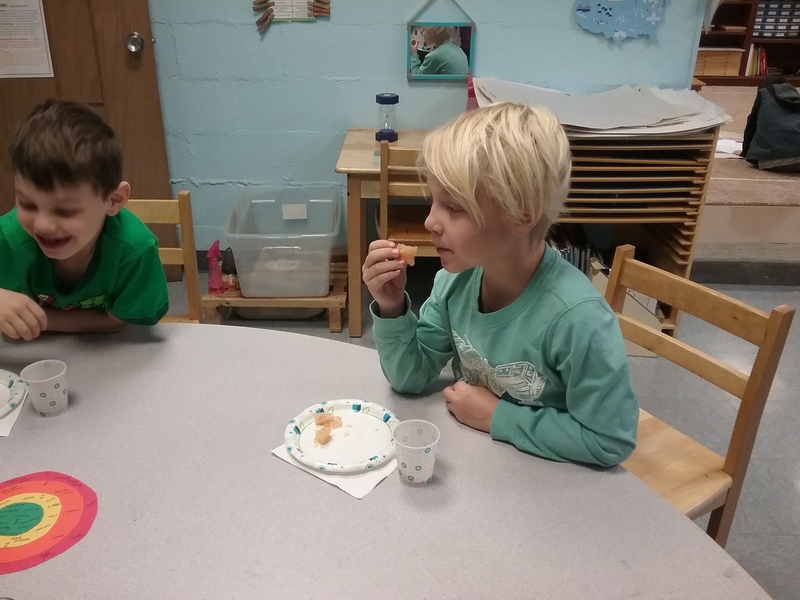 While they discussed nutrition, they sampled different foods from each food group. Here, they are sampling grapefruit! This student was not impressed! 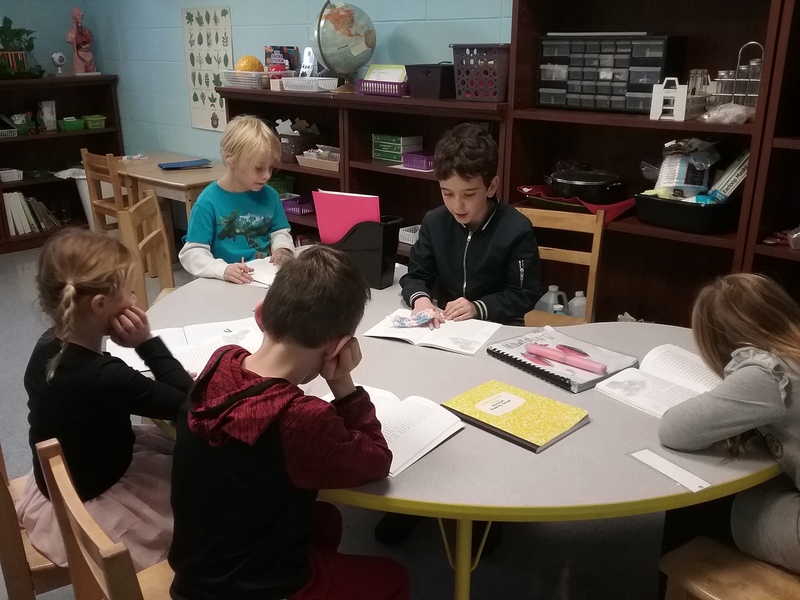 When we start a new short story in our “Rocket Rollers” Reading Group, I read the story first and we talk about unknown vocabulary or different spelling rules they will see in the story. This second year student heard we were beginning a new story and asked to lead reading group! He read “Jack and the Beanstalk” to these first graders and discussed the story with them! 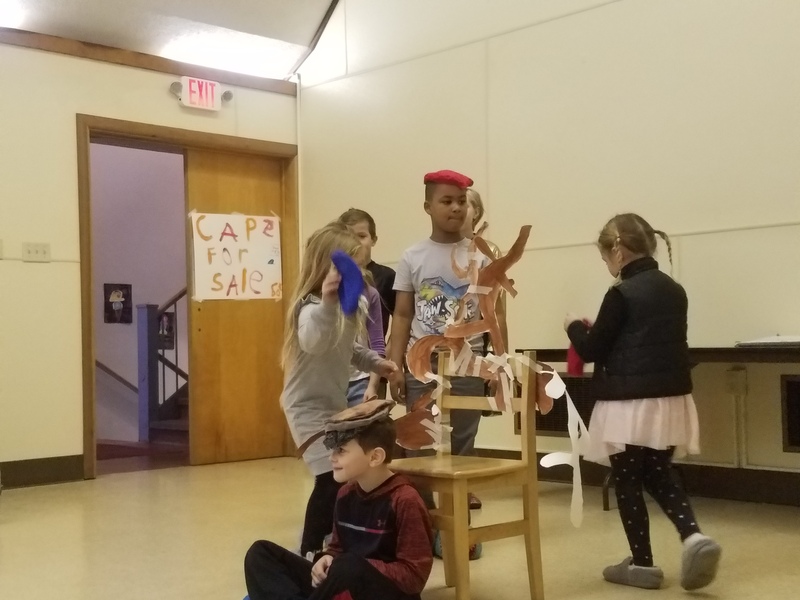 We had such a blast preparing for and performing “Caps for Sale.” Each student had a chance to use the sewing machine to make their own cap! 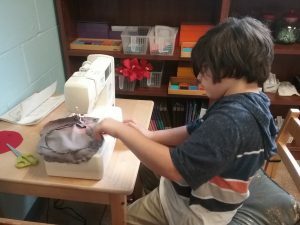 So many students had their very first sewing machine experience this week! They were so proud and had a lot of fun. Thank you to our parent volunteers that helped make this possible! Next week our blog will be written by two students! You can look for a student written blog at the end of each month! Our first year students will be creating a noun family chart, will continue their study of the constructive triangles, and will complete their continent study of North America. Our second year students will discuss the four types of sentences (exclamatory, interrogative, imperative, and declarative), will review the Detective Triangle Game, and will finish their research of a country in North America. Our third year students will learn to measure in grams and milliliters, will discuss adjective suffixes, and will begin studying equivalence with our metal insets. Our fourth year students will change mixed fractions to improper fractions and improper fractions to mixed fractions, will review homonyms and indirect objects, and will discuss the creation of the universe. Fifth year students with begin plotting points on a graph, will review homonyms, and will study adverbials. Upper Elementary students will also take their first note taking quiz which will show them if they are taking notes effectively or not. This will give students an opportunity to learn which information is vital at lessons and prepares them for middle school and beyond! All students will begin typing lessons next week! Parent-Teacher Conferences – Friday, November 16 – No School Day for students. I will send out a sign-up genius for conferences in next week’s blog! Posted on October 19, 2018 at 10:33 pm. As we have discussed in conferences, Parent Education Nights, and in our blog, the Elementary aged child is in a new stage of development where social connections are extremely important. When a child is just beginning to navigate these waters of what is fair or unfair, right or wrong, socially acceptable or not, there are plenty of times when they make the wrong decision and need guided through the proper way to handle situations. This week in our classroom we discussed “The Four Agreements.” These are four standards we have all agreed to hold ourselves to in the Elementary classroom to help us be kind, caring, and productive members of our classroom and of society. We discussed what each agreement means and that we would continue to practice them together every day. Please take some time this weekend to discuss them with your child! Mutual Respect – We recognize and appreciate our differences and similarities. We consider and honor all values, beliefs, and needs of others. We respect individual skills, talents, and contributions. We offer feedback to each other that encourages growth. Attentive Listening – We pay close attention to others and let them know they have been heard. We maintain eye contact, withhold our own comments, and paraphrase key words to show we’ve been listening. We listen with our ears, eyes, and our hearts. Appreciation/No Put Downs – We show kindness and respect. We avoid negativity, name calling, and hateful gestures or behaviors. We treat each other kindly. We state appreciation for all individuals. Right to Pass – We have the right to share or pass while still participating. Choosing the right to pass means that the person prefers not to share personal information or feelings or to actively participate in the group at a particular moment. Being a silent observer is still a form of participation and can lead to greater learning. 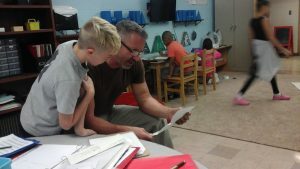 This week we had our first “Bring Your Parents to ‘Work Time’!” Take a peek below at the fun we had! Ms. Kelley is giving a handwriting lesson to these students and two of our parent visitors! 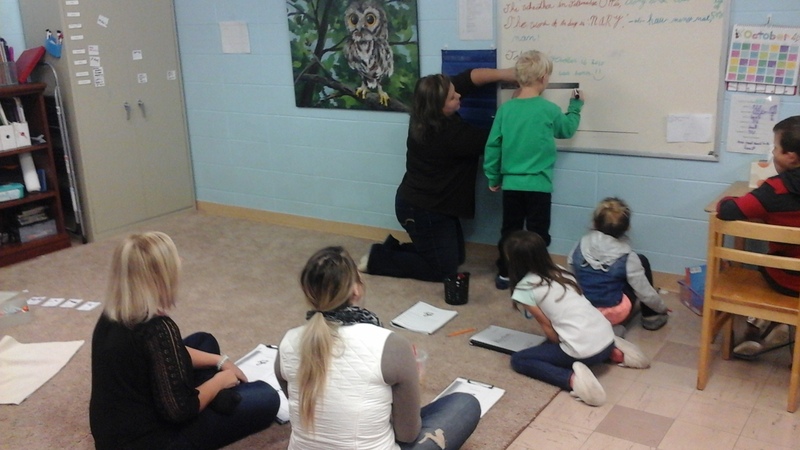 In our classroom, we use a handwriting approach that appeals to all learning styles. 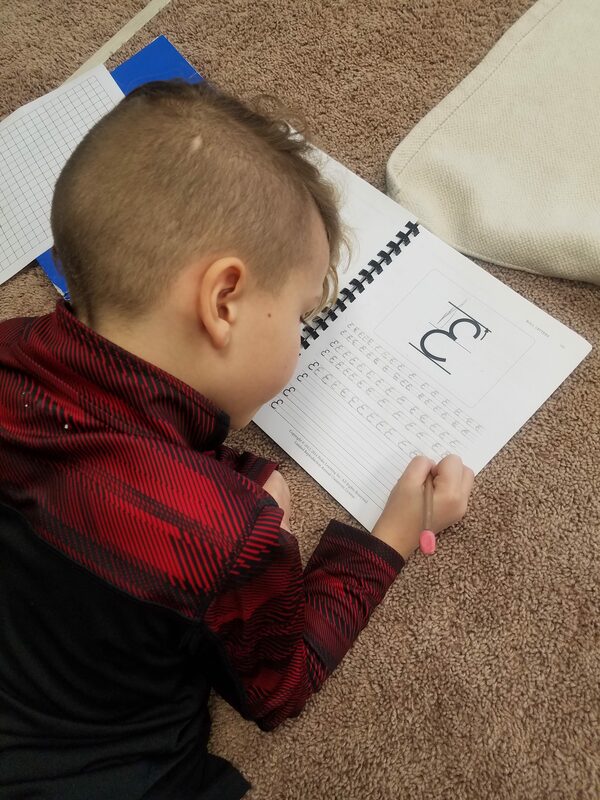 Throughout each lesson we air trace each letter with our arms, trace over Ms. Kelley’s example, and write our own examples, all while repeating key phrases to help us remember the proper formation of the cursive letters! This fourth grade student and his dad are writing and reading Chinese words together. This student asked for a list of beginning Chinese symbols and pronunciations. They wrote sentences together and listened to examples with Ms. Marlee! 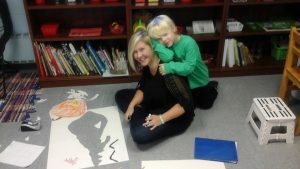 This student and his mom are helping create our Halloween decorations for our party next week! They made different pumpkins and creations to make our room spooky for the party! 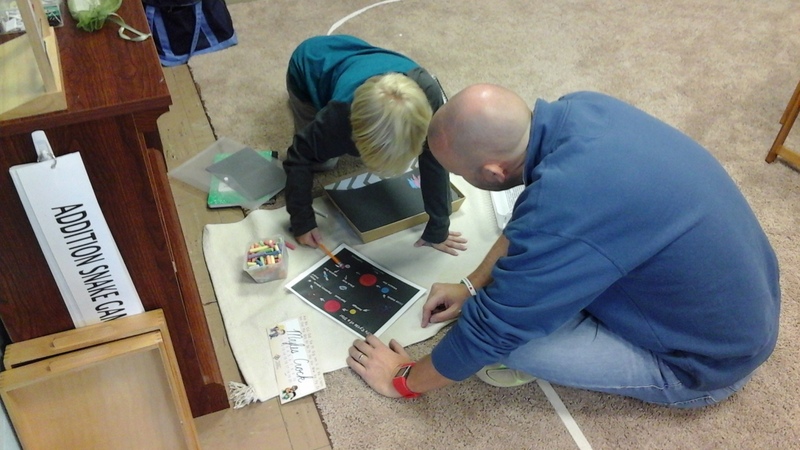 This first grader and his dad are working together to learn about Stellar Evolution. They drew examples and discussed what each stage was! This student and her dad are working on her “Word of the Week.” Each week, Upper Elementary students choose a word that they think no one else will know. Next, they design a poster that illustrates their word, without giving away the definition – like a movie poster. On Monday, during Community Meeting, these students perform a skit to show what their word means. 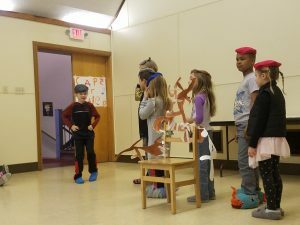 At the end of each skit, the Lower Elementary students guess what the word may mean. The Upper Elementary students share their definition and part of speech at the end. 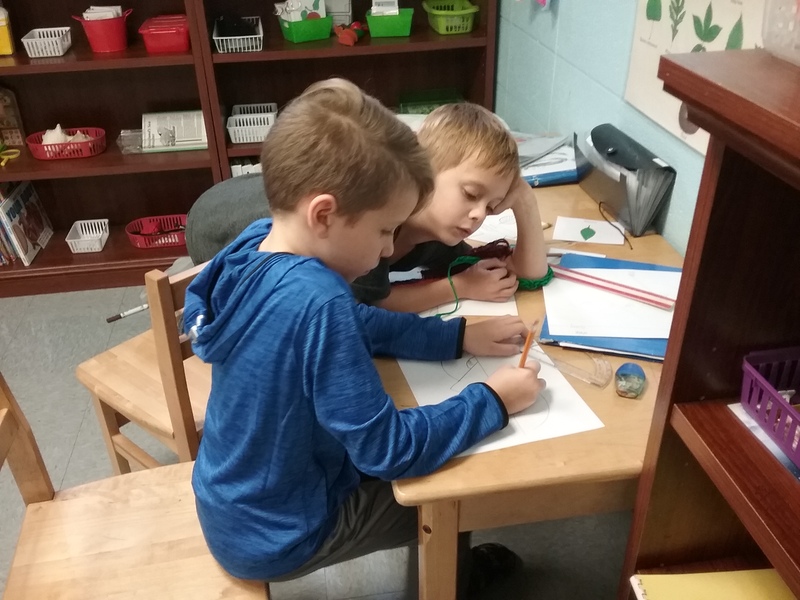 This third grader and his mom worked on multiplication equations and came to an equivalence lesson during their time together. 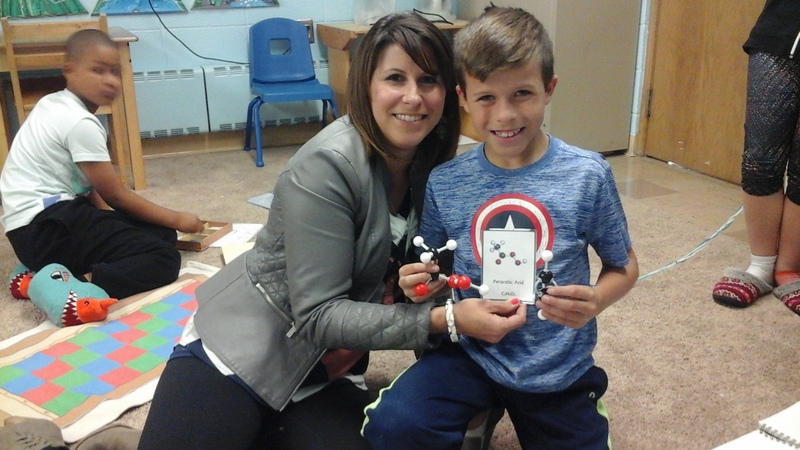 Later, she was able to see the work this third grader did with making molecular compounds! Thank you to all of our parents that were able to make it! Your students really love showing you what they do each day and we love having you! Next week, we will have our two “Caps for Sale” performances. Make sure you check your email for the details! Lower Elementary students will study adjectives, constructive triangles, nutrition, and weather. Upper Elementary students will discuss decimals, greatest common factors, etymologies of words, the adverb, and the structure of the Earth! “Caps for Sale” Parent Performance – Wednesday, October 24, at 8:30 in the gym.